the command line to run applications and to view logs. a browser to test locally and to access the local developer console. the command line to deploy the application. a browser to view a live application's dashboard. I began to think about how unfriendly command line interfaces can be, and how much repetitive typing I had been doing to test and deploy applications. With that said, I worked with John Grabowski of the Google Mac team and Brett Slatkin, an engineer on App Engine, on a 20% project to make Google App Engine Launcher for Mac OS X. 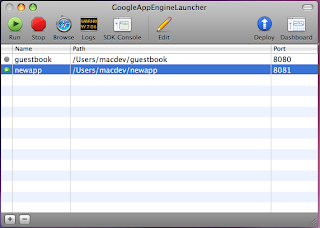 Now, App Engine Launcher is not a replacement for your code editor or your IDE. It improves your App Engine development experience by managing a list of your applications. With a few clicks you can run, browse, deploy, and view logs for your applications. It also has some added sugar thrown in like drag and drop, integration with your editor, and quick links to the local developer console and the live application dashboard. Download it now. If it's missing a feature that you'd like to see (like scripting, a Windows or Linux version, human-level AI ;), let us know in the Discussion Group.